The UDC Foundation seeks to establish strategic partnerships with corporations and build mutually beneficial relationships with the foundation community. Partnerships with the University of the District of Columbia benefit students pursuing undergraduate, graduate and professional degrees at our colleges (Arts & Sciences; Business & Public Administration; Agriculture, Urban Sustainability and Environmental Sciences; and Engineering & Applied Sciences) as well as those seeking workforce credentials, professional certifications, and associate degrees at our Community College. UDC also has a nationally ranked law school which is supported by the DC School of Law Foundation. Each year, over 200 scholarships, stipends and mini-grants are awarded to students across the University by the UDC Foundation. When you partner with the University of the District of Columbia, you invest in nationally competitive programs that are affordable and accessible to citizens throughout the greater metropolitan region who are seeking pathways to the middle class. From research partnerships, to program support, to recruiting relationships, working with the University of the District of Columbia can advance your corporation’s strategic positioning, mission, and goals. It also can expand the frontiers of science, technology, medicine, social service and the arts. Corporate partnerships build upon the University’s value proposition and needs in recruitment/hiring, financial aid for students, internships/apprenticeships, research collaborations, lectureships and technology transfers. Foundations seed a great deal of research at UDC. We aim to identify opportunities—programs, research activities, capital projects, fellowship needs, and other elements of university life—that parallel foundation giving priorities. We invite corporations and foundations to review funding activities that may lead to innovative, large-scale solutions to urban problems or to transformational impact through support of UDC’s schools and colleges, academic and cocurricular programs, and research initiatives. 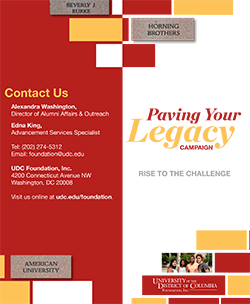 For information on how your company or foundation might partner with the University of the District of Columbia, please contact our major gifts officer, John Smith, at john.smith2@udc.edu or 202.274.5363.